The terra incognita of the future is beyond the ken of scientific projection and social prophesy. Although deep uncertainties—and human choices not yet made—undercut our capacity to predict what will be, scenarios help us to imagine what could be. Global scenarios are stories about how history might unfold in this century. Beginning with contemporary trends and driving forces, each embodies different assumptions on the resolution of critical uncertainties and human choice—thought experiments for stimulating imagination, alerting us to dangers, and inspiring corrective action. Exploring the frontiers of the possible helps gives soul, sight, and direction to the blind march of history. 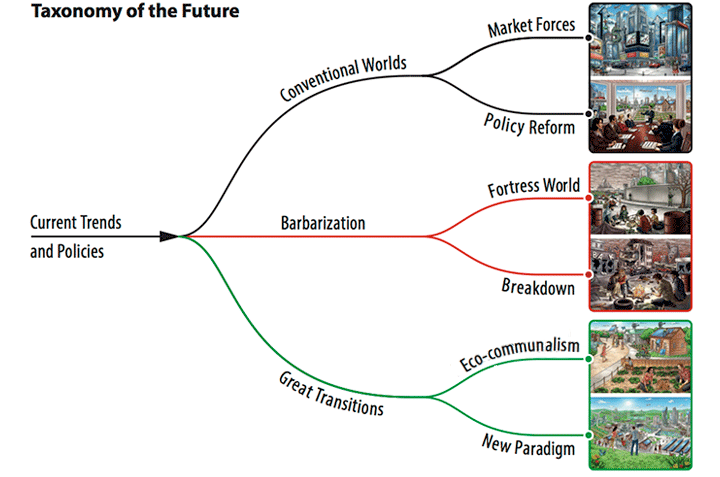 The Global Scenario Group, precursor to GTI, introduced a simple and widely-used "taxonomy of the future" to organize the possibilities. At the highest level, three broad channels—Conventional Worlds, Barbarization, and Great Transitions—radiate from the present into the imagined future (see graphic). Conventional Worlds are governed by today’s dominant forces of globalization: economic interdependence deepens, dominant values spread, and developing regions gradually converge toward rich-country patterns of production and consumption. Barbarization explores the very real risk that Conventional Worlds strategies prove to be inadequate for addressing mounting environmental and social stress, and problems spiral out of control, leading to a general crisis and the erosion of civilized norms. Great Transitions examine worlds that transcend reform to embrace new values and institutions in pursuit of a just, fulfilling, and sustainable civilization. We consider two variants each for Conventional Worlds, Barbarization, and Great Transitions, a total of six visions. Click on the images for a description and visualization of each vision.